Fixing damaged garage door springs can be a tricky task. But with our team at Garage Door Repair Richmond you have nothing to worry about! The spring is a metal coil that supports the weight of the garage door while it opens and closes. It is important to know what kind of spring you have at home so that you could foresee some of the potential problems you'll eventually have to deal with and determine the proper solutions. There are two main types of garage door springs, and those are torsion and extension. The extension type stretch out when opening the door and contract when it is closing. These springs are cheap, but they can easily wear out. Safety cables are used in order to assist and prevent them from hitting someone or something when they break. 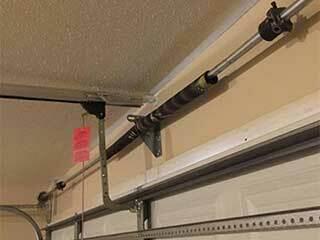 In contrast, torsion springs make use of a twisting and unwinding motion when you open or close your garage door. They are more expensive but are also much more durable and are, therefore, able to support much heavier weights. Can't I Replace Them By Myself? It's highly inadvisable that you attempt to do so. Springs are under a great deal of tension, and any mishandling can lead to catastrophic results. These crucial components should only be handled by professional technicians who are equipped with all the required tools. With some proper inspection on a routine basis, you'll be able to avoid most of the potential spring related problems your door could suffer from. Lubrication, provided it involves a substance of the correct type (consult your owner's manual to be certain) is another great way to ensure your spring's longevity. At Garage Door Repair Richmond, we offer a range of spring repair solutions that include both adjustments for springs that are out of place, and lubrication maintenance that will prevent corrosion and ensure operational efficiency. All of our services are intended for both torsion and extension springs. In most cases, damaged components cannot be fixed and so we offer full replacement services.